We’d love your help. Let us know what’s wrong with this preview of Serpent's Sacrifice by Trish Heinrich. Ever since Alice was saved from her abusive father, she's wanted to be a hero. But in 1960's Jet City, women are supposed to want marriage and babies, not cowls and secret identities. When Alice's beloved aunt is brutally murdered by a new crime syndicate, she takes up the mantle of the Serpent, a heroine who has been protecting Jet City for decades. Fighting alongside the masked vigilantes American Steel and Shadowmaster, Alice vows to bring her aunt's killer to justice. But one mistake unleashes a nightmare villain. One who will stop at nothing to take control of the city and kill anyone who stands in the way. To ask other readers questions about Serpent's Sacrifice, please sign up. "Serpent’s Sacrifice" is an excellent first novel and is the gateway book to a new series focussing on super-heroes more-or-less based on those of the fifties. Alice, the Serpent, is one of a team of three along with Lionel and Marco—each one of which has a specific power. There are a number of supporting characters and—of course—a super-villain with evil helpers. But this book is quite unusual in a number of ways. Particularly important is the opening section set in 1947. It is dark and very dis "Serpent’s Sacrifice" is an excellent first novel and is the gateway book to a new series focussing on super-heroes more-or-less based on those of the fifties. Alice, the Serpent, is one of a team of three along with Lionel and Marco—each one of which has a specific power. There are a number of supporting characters and—of course—a super-villain with evil helpers. But this book is quite unusual in a number of ways. Particularly important is the opening section set in 1947. It is dark and very disturbing. While it only comprises four chapters, its effects resonate through the entire novel. Linked to it is another interesting feature of the book. As a series opener, one expects a definite story arc which will have its own independence and yet be part of an overarching plot. This happens, but the opening arc is more psychological in nature than is usually the case. Alice is on a quest for self-identity and emotional control—problems that have their roots in that opening prelude. For her, the super-hero role is both a way of avoiding and discovering her inner nature. The external battles she fights are mirrors of her inner conflicts. The responsibility of properly acting out the super-hero identity will finally lead to her taking ownership of the qualities that she is afraid to face and yet are necessary for true self-awareness. Thus, we get a great deal more dark introspection than is usually the case in this genre. This is Alice’s story and the supporting cast are all there to help focus her central problem. They are nonetheless quite interesting in themselves. Lionel and Marco are not mere sidekicks; they have problems that mirror those of their team-mate. Mrs Frost is a mentor-like figure who, by her questioning and criticism, helps provide a moral compass for Alice. The book is filled with very graphic and violent action. While the battle scenes are expertly described and certainly very exciting, there is a sameness to them and there are too many. A little more careful management of this aspect of the plot would be helpful in future books of the sequence. Heinrich does not shy away from action and pain, lemme tell ya. I almost thought this book was written by a doctor because each kick, punch, throw, or slam felt real. She sustained not only good action descriptions to help you follow what's happening, but she honors the damage each character sustains. There's no Mary Sue-ing going on, even with the superheroes involved. I appreciated this because it gives into the authenticity she's going for with the superhero/1960's/Glory Days vibe. Maybe she' Heinrich does not shy away from action and pain, lemme tell ya. I almost thought this book was written by a doctor because each kick, punch, throw, or slam felt real. She sustained not only good action descriptions to help you follow what's happening, but she honors the damage each character sustains. There's no Mary Sue-ing going on, even with the superheroes involved. I appreciated this because it gives into the authenticity she's going for with the superhero/1960's/Glory Days vibe. Maybe she's also a vigilante, but each character carries the weight of their injuries—physical and mental—that is believable and sustained. We don't have of this "walk it off" nonsense here. Okay, so I'm a sucker for feminism, so I'll bite. There's a lot of female empowerment in this book. I wouldn't say it's "perfect" feminism, but who really pulls it off every time? I'd like to this of this novel as the femme version of Batman where you've got a female protagonist, a few female role models, a female tech specialist, and a slew of male characters that know how to work with women to get the job done. No one's really portrayed as better or stronger than the other, which is nice. We've also got some pivotal characters that aren't white! Huzzah! I could gush more about the feminist elements that I love, but that might give too much away. There was this sort of redundancy that happens throughout the novel that was somewhat frustrating—the martyr trope. There is at least one scene where Alice/Serpent, Lionel, or Marco tell the other two to get out and they would stall or fight. Everyone takes turns doing this, and the other two always insist on staying and fighting as a whole team. I understand the need for this every once and a while, but it felt like it happened every fight. It got tiring after a while and it didn't show as much individual or team growth as I'd like. I also cringed a bit at the amount of mixed signals Alice gives both of the men. It's obvious early on that she looks up to, trusts, and likes both of them. She admires both of their bodies and personalities. And you can tell they both really like her back—Lionel is an exceptionally open book. It was cringey how obvious it was that they both liked her, and yet she would almost kiss or insist on being embraced for comfort, giving private and public mixed signals. I'm already not a fan of love triangles because they are often so tropey (noteably in YA fiction), and so this might've worked for other readers, but I wanted Alice to pick one and be clear about it. You'll have to read the novel to see where the love triangle takes them. A solid story, good teamwork, and... well, the characters all felt a little flat. Also? Ms. Heinrich is badly in need of a proofreader who is aware that the proper way to make a plural of a word which ends in y isn't apostrophe-s. This story takes place a little after World War 2. I am so used to reading stories about the future that getting used to knowing I was in the past was like first dipping a toe into the swimming pool and then slowly walking into the water. After a little while I was immersed and acclimated. Trish brought the main character, Alice, to life for me. It did not take long for me to identify with her so closely that I felt the story was happening to me (and I'm an old guy). The pacing of the story had This story takes place a little after World War 2. I am so used to reading stories about the future that getting used to knowing I was in the past was like first dipping a toe into the swimming pool and then slowly walking into the water. After a little while I was immersed and acclimated. Trish brought the main character, Alice, to life for me. It did not take long for me to identify with her so closely that I felt the story was happening to me (and I'm an old guy). The pacing of the story had enough variation to keep my interest: slower in sections to give enough exposition to know what was going on, as well as rapid-fire action sequences that I had to remember to breathe after. The treatment here for the outcast (economic, gender, racial, special powers, and probably others) made for a David vs Goliath feel, let alone light vs dark. The message that everyone matters is clear. I never quite know how to judge when the amount of foreshadowing tips over the edge and becomes too much. I think Trish hit just the right balance, unless just a bit over the edge. The reader is definitely aware of much more than the individual characters, and sometimes it seems like their ignorance is a bit contrived. Nevertheless, my enjoyment was not degraded. There were also some sections that were confusing based on the verb tense used. I was not sure if it was deliberate, to hint at something in the past or future, or just in need of some cohesion. Again, this did not make me like the story less. Intriguing book. Alice has always wanted to be a superhero since she got away from an abusive father. She’s a totally strong character and wonderful to read about. I really likes this read! It has great characters, outstanding story line and emotions galore. If you like a well written urban fantasy novel with a lot of emotional appeal, then give this one a try. You won't regret it. This is the story of three vigilante’s, two (Margo and Lionel) with hidden powers and the third (Alice) is a close friend who is very good at martial arts. The story takes place in the late 40’s into the 50’s where there are many social issues that the three try to overcome. The ending leaves you in suspense, but overall a very good read. The first book in a superhero series set in the 1960s US. The story starts in 1947 when Alice Seymour is 10. She lives with her mom and her abusive father. He’s a former soldier and apparently had traumatic experiences in a war and that’s why he beats his wife. Alice is afraid of him and spends as little time at home as possible. She hangs out with her best friends, Lionel and Marco. They all three also run away from the local bullies. One day, all changes. Alice’s mom is killed in a shoot-out at The first book in a superhero series set in the 1960s US. In 1947 we’re introduced to Alice Seymour, Marco Meyer, and Lionel. They are children ages 9 to 12, living in a poor section of Jet City. Alice’s father is a drunk and beats her and her mother. When her mother is killed during a robbery, her mother’s sister, Aunt Diane Miller and her husband come to take Alice away. The story then jumps to 1959, and Alice is a young woman, just out of college with a degree in business. She’s taking over her aunt’s business, Atlas Bookstore, and plans to live in the loft. Her aunt also teaches her how to fight. One night Aunt Diane is killed by a group of men, and now Alice has lost a second person close to her. She’s also attacked one night, and fights the men off, then meets the local superheroes, Shadow Master and American Steel, not recognizing them at first, for they are her childhood friends, Marco and Lionel. Now she joins them and wants to help fight crime and find the killer of her aunt. With the help of the first super heroine, The Serpent, she takes on the guise of the third incarnation of the super heroine, and learns that a crime syndicate is operating in the city ran by the mysterious Phantasm. Her aunt, Diane was the identity of the second Serpent. Okay, I loved the story and characters, and the novel was well written. It kept my interest throughout, and kept me turning the pages. But I didn’t like the ending. In comic books you can have the super hero fighting the villain forever, but in a novel, I want to see a conclusion. I want to see the battle between good and evil at the end of the story. I don’t want to read three to four hundred pages, then find out I have to get the second novel to “maybe” find out how the hero wins the struggle with the villain. And that’s the weakness in the novel. The reader has invested their time and thrilled to the action, as it leads to the final confrontation between the hero and villain, and when it doesn’t happen we’re left empty – or mad. Hey, I was expecting a big fight scene between The Serpent and Phantasm. But it didn’t happen. Maybe in the next three to four hundred page novel? But I do recommend this book very highly. Great characters, good story telling, and great action. Serpent’s Sacrifice is the first book in Trish Heinrich's Vigilantes series of super hero novels. Set in the fictional Jet City that bears some resemblance to parts of the Pacific Northwest, the book follows Alice from her childhood with an abusive father to her adulthood where she takes on the mantle of the super hero known as Serpent. Accompanied by two of her childhood friends, the three young heroes fight against a mysterious Syndicate that seems bent on destroying the place they call home. T Serpent’s Sacrifice is the first book in Trish Heinrich's Vigilantes series of super hero novels. Set in the fictional Jet City that bears some resemblance to parts of the Pacific Northwest, the book follows Alice from her childhood with an abusive father to her adulthood where she takes on the mantle of the super hero known as Serpent. Accompanied by two of her childhood friends, the three young heroes fight against a mysterious Syndicate that seems bent on destroying the place they call home. The book opens in 1947, when Alice is nine years old, but spends little time on that portion of her life. Nonetheless, these few chapters lay the groundwork for the remainder of the book, set in the late 1950s and early 1960s, focused on Alice as a young woman just starting out her adult life. The book deals with heavy issues, including spousal and child abuse, racial injustice, and rampant sexism, but Heinrich handles these topics skillfully. One of Heinrich’s particular strengths is writing detailed combat sequences. The reader can track every punch thrown and every bone broken in exquisite detail. These fight scenes are not for the faint of heart, either—Heinrich’s heroes get beat up plenty, and she takes the after effects of their injuries into account. Serpent’s Sacrifice is classified as new adult, but it is generally young adult friendly. However, readers should be warned that Heinrich does not flinch from her descriptions of the spousal and child abuse early on in the book, and some readers may find this aspect extremely uncomfortable to read. Overall, however, this is a detail that is important to the story, and is worth pushing through to fully appreciate the character of Alice and her relationships with other characters in this beautifully crafted world. Of course I'm going to read about superheroes. I went into this book expecting a fun, action-packed adventure, and I was delighted by how much more this story held. Female main characters are often used for the sake of just having a female main character, but the time period this book was set in allowed for a lot of feminist exploration. That, in a superhero book, I found really compelling. There were a lot of modern comparisons to make from the simple set-up: "in 1960’s Jet City, women are sup Of course I'm going to read about superheroes. I went into this book expecting a fun, action-packed adventure, and I was delighted by how much more this story held. Female main characters are often used for the sake of just having a female main character, but the time period this book was set in allowed for a lot of feminist exploration. That, in a superhero book, I found really compelling. There were a lot of modern comparisons to make from the simple set-up: "in 1960’s Jet City, women are supposed to want marriage and babies, not cowls and secret identities." It was great to see how Alice tried to break out of those expectations. It was also interesting to see how the other characters reacted to it. I think any female reader would nod along at certain parts, and these struggles might be good for some men to recognize too. But the book didn't stop there. Set in the 1960s, of course racism was incorporated into this world-building. The book's characters who are equally as smart and talented as their white counterparts aren't used as simply token black characters, but instead they play vital roles in the action. Also, the book tackles the traumas of abuse and alcoholism, making them real issues that Alice has to deal with as she grows into an adult. Alice is swept away from her abusive father and her best friends to live with her rich aunt in Jet City. While well-to-do women in the 1960s are expected to marry well and have children, Alice longs for something much more. She trains to be a powerful fighter and takes up the mantle of the city's infamous superhero, Serpent. A vicious villain is making people cower in fear, experiencing waking nightmares. Alice and her friends must stop the madness before their enemy takes over the city, but are Alice is swept away from her abusive father and her best friends to live with her rich aunt in Jet City. While well-to-do women in the 1960s are expected to marry well and have children, Alice longs for something much more. She trains to be a powerful fighter and takes up the mantle of the city's infamous superhero, Serpent. A vicious villain is making people cower in fear, experiencing waking nightmares. Alice and her friends must stop the madness before their enemy takes over the city, but are they willing to pay the price to do so? I received a free copy of this book with no obligation to post a review. This is my honest review. Based in the 1940 and 50s, this is not your typical super hero story. It is an origin story of sorts and while it has hints of a typical origin story it isn’t an overall typical one. For one, the main character has no out of the ordinary powers, but she is no Bruce Wayne either. There are characters who have extraordinary powers, but they are not all what we typically think of when we think of super I received a free copy of this book with no obligation to post a review. This is my honest review. For one, the main character has no out of the ordinary powers, but she is no Bruce Wayne either. There are characters who have extraordinary powers, but they are not all what we typically think of when we think of super heros. I greatly enjoyed this book for many reasons. It has a main character who starts out her journey from a home which has lacked love, but that is not where she spends her entire life. She decides that she will not remain the victim through her life and does something about it. Loved this book. At first I was hesitant to read it since it was about superhero, but I am so glad I did. While it has a superhero theme, these characters come alive as people and Trish spends a good deal of time developing these characters as people first, superhero next. It was a hard book to put down as I needed to know more and more about what happened to each character. I absolutely cannot wait to read more about Alice and her friends. I received a free copy of this book with no obligation t Loved this book. At first I was hesitant to read it since it was about superhero, but I am so glad I did. While it has a superhero theme, these characters come alive as people and Trish spends a good deal of time developing these characters as people first, superhero next. It was a hard book to put down as I needed to know more and more about what happened to each character. I absolutely cannot wait to read more about Alice and her friends. AN excellent read!! sacrifice,hardship,sexism and racism can't stop this hero and her friends from fighting to protect their city..well crafted and likable characters,and a darn good story ranks this book high on my list! I urge everyone to get this book into the hands of a young adult....THIS author has a story to tell,and they should be listening! The real hero (pun unavoidable) is Serpent. Time period is later than the original pulp novels of the 30's, but you'll recognize shades of Doc Savage and The Avenger. Emerging super powers explained by science. Ripping good yarn, suitable for 10 years and up. Action packed from beginning to end. It's easy to fall into the world she creates of superheroes even if you're not that familiar with it (like me, who doesn't know much beyond the major blockbuster movies out there). A satisfying ending but leaves you eager for the second! Very well-written, descriptive without being wordy, action-packed, and filled to the brim with complex and fascinating characters! I'm 25 and I'd be the first to admit superheroes aren't really my thing, but I couldn't put this book down. Well done! I'm a fan. I initially put this one at 3 stars, but rounded it up to 4. This was a really good read, and I was extremely impressed with the intricacies of the plot. The author did an amazing job of creating a world, outlining plot lines with twists and turns, and giving backstory. I connected a little bit more with the beginning of the book, but enjoyed it all the way through (finished the book in two chunks, more or less). There are only two big reasons that I initially put this at 3 stars. First, I’m jus I initially put this one at 3 stars, but rounded it up to 4. This was a really good read, and I was extremely impressed with the intricacies of the plot. The author did an amazing job of creating a world, outlining plot lines with twists and turns, and giving backstory. I connected a little bit more with the beginning of the book, but enjoyed it all the way through (finished the book in two chunks, more or less). There are only two big reasons that I initially put this at 3 stars. First, I’m just not a huge fan of love triangles, but I get that there’s a market for that. Second, the fight scenes were impressively detailed, but a little long for my taste. I think someone who is an avid superhero/comic book fan would be able to keep up perfectly, but I got a little dizzy. Oh okay, one more. I was bummed that the ending left me on a cliffhanger. I understand that that’s what sequels are for, but it was a LONG book and I felt like we (me, Alice, Marco, Lionel, Uncle Logan, all of us) worked very hard for a conclusion that we didn’t really get. Trish Heinrich is an Indie author from the Pacific Northwest, a mother and a total geek! When not writing she can be found sipping copious amounts of coffee while reading and trying to keep her adventurous children occupied. 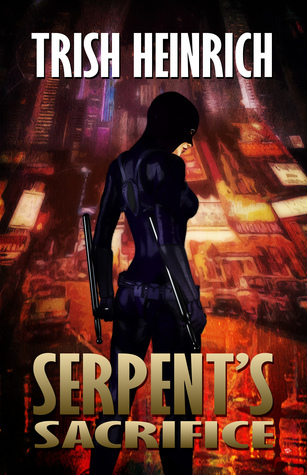 Serpent's Sacrifice is her first published novel and the first book in The Vigilantes. She is also working on the Ellen Starr, Girl Adventurer! series of YA pulp novels.